The sweltering heat of summer hit our area early this year. It has been in the high 90’s and low 100’s for several days now which is normally August weather for us! Needless to say, my plants are struggling a bit in this heat. Thankfully all of my hydrangeas are fairing well so I figured I’d better capture their beauty and bring some inside to enjoy! 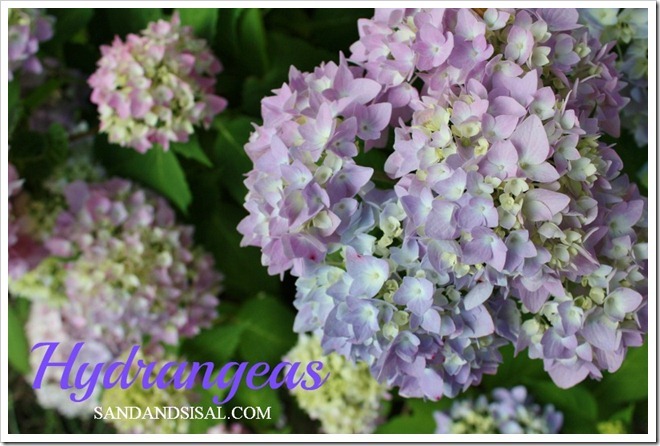 Today I’m sharing a few Hydrangea Arrangement Ideas that are gorgeous and easy to arrange. If you are following me on Instagram, then you already saw this pretty picture above of one of my hydrangea arrangement ideas using purple hydrangeas with chasteberry tree branches paired with glass floats and starfish. 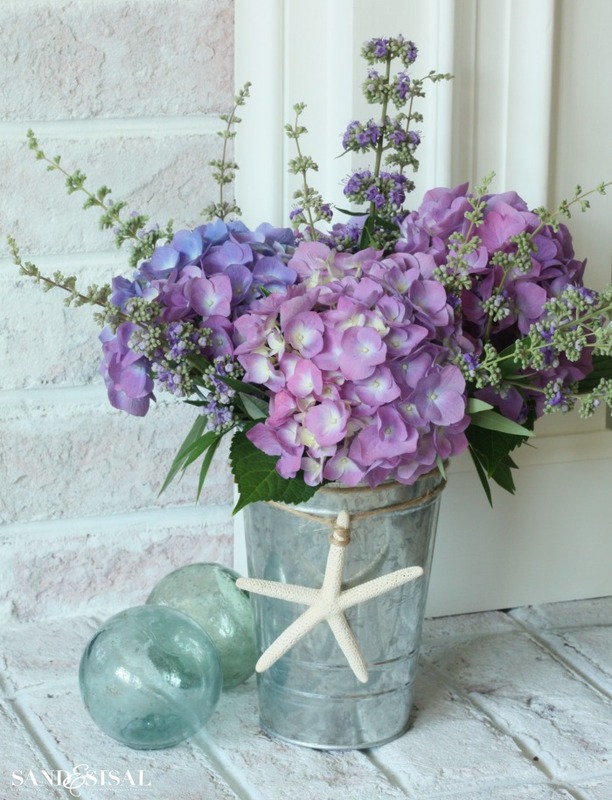 The shades of purple and blues look beautiful with silver like this sweet little galvanized pail. The beauty of hydrangeas is that each blossom is HUGE! One single bloom can fill your entire vase! The range of colors on one bush is also amazing. The colors can range from dark purple, hot pink, pale pink, lavender, blue and green! It’s a virtual calidescope of color. 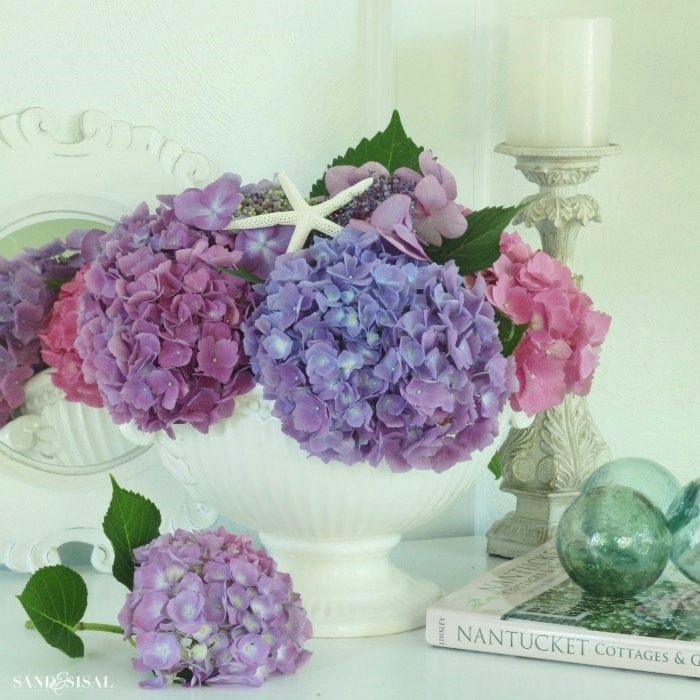 A creamy white ceramic soup tureen can serve as a beautiful vessel for a hydrangea arrangement. Here I am using a combination of Endless Summer Hydrangeas and Lace Cap Hydrangeas. Placing mirrors behind your bouquet will not only reflect your beautiful flowers but will also give the illusion of even more flowers! To change up the same arrangement, take the mirror that was behind the flowers and place it under the soup tureen. Add artwork in coordinating colors in place of the mirror. This geometric art you see behind is one of my daughter’s creations. A quick and easy coastal centerpiece is to fill a vase full of clean shells, add some sisal rope and a few fluffy hydangeas. Click HERE to get all the details on how to make this rope centerpiece and votives. 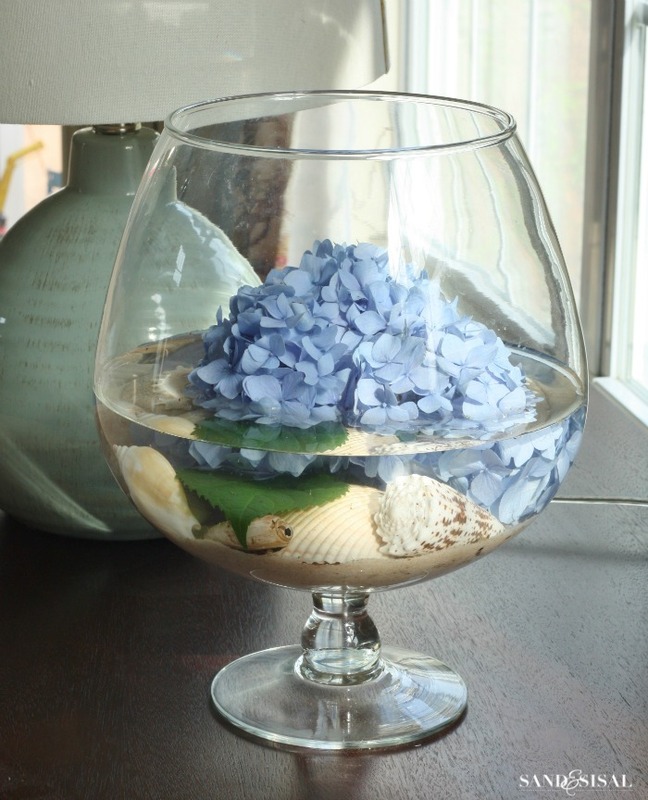 If you have a larger vessel, then try this beachy and creative arrangement. 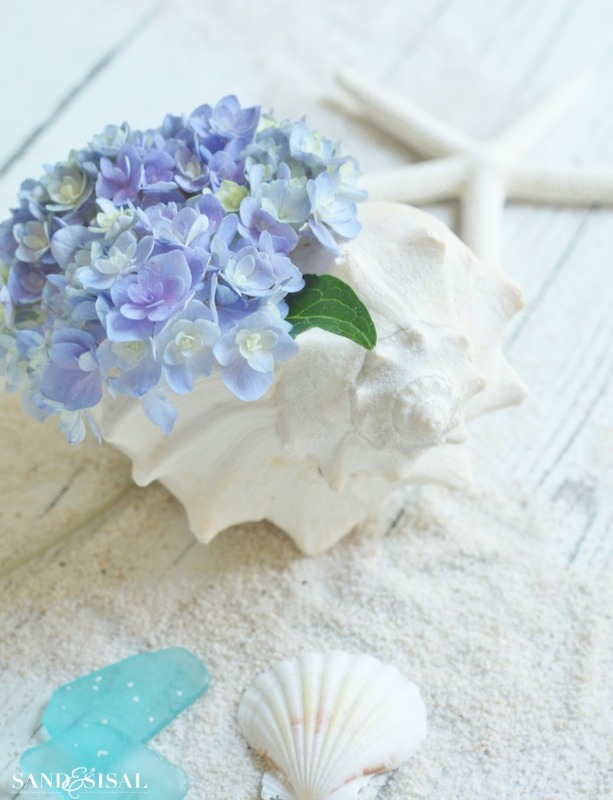 Fill the bottom with a bit of clean sand (pool sand or craft sand) and then add a few shells, a bit of water and then float a large hydrangea bloom in the center. Need a small flower arrangement for a bedside table or bathroom? 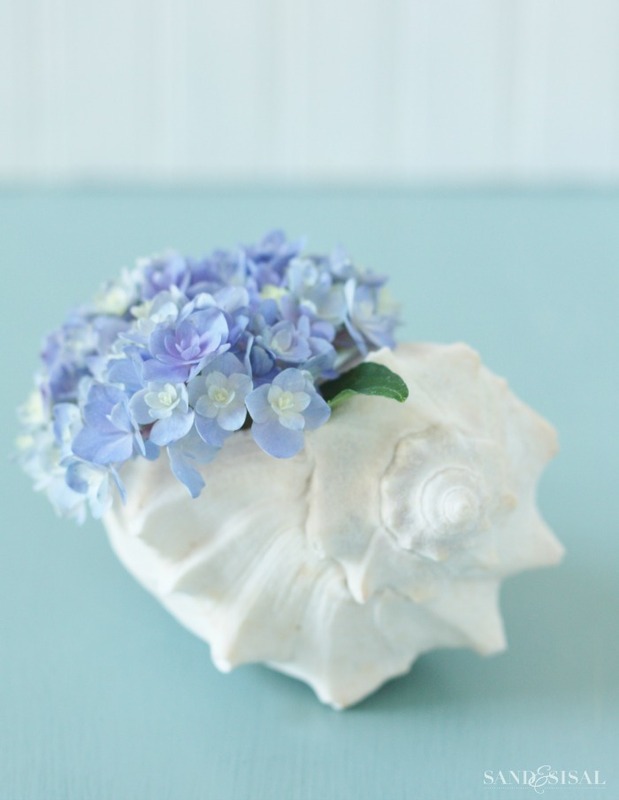 Pour a little bit of water into a clean whelk shell and insert a small hydrangea bloom inside of it! 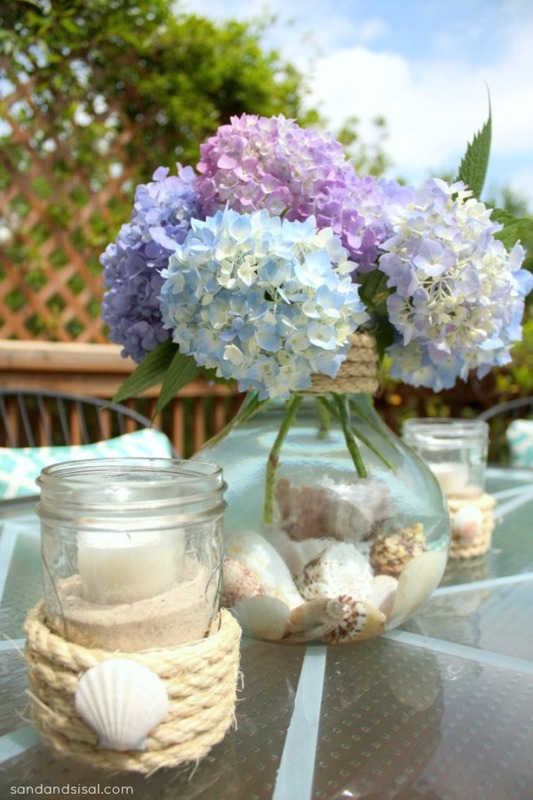 I love the beachy look of this arrangement. 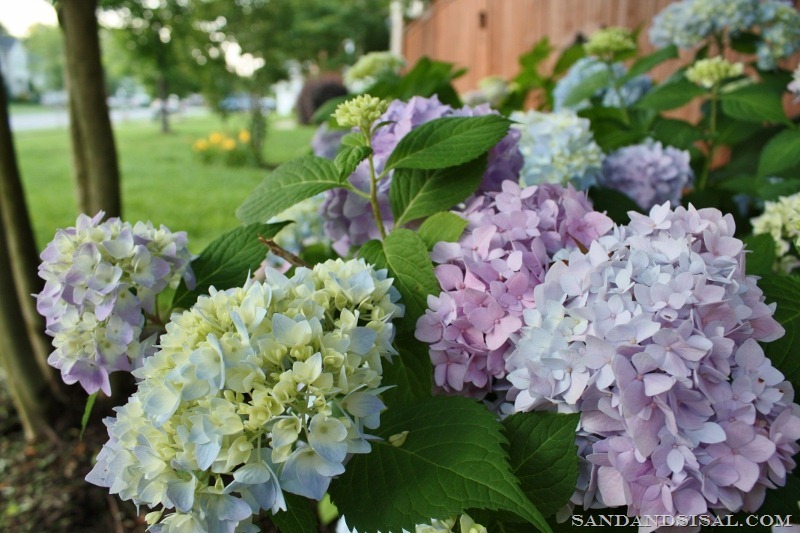 My home is filled with gorgeous hydrangeas and it brings a smile to my face with every turn! 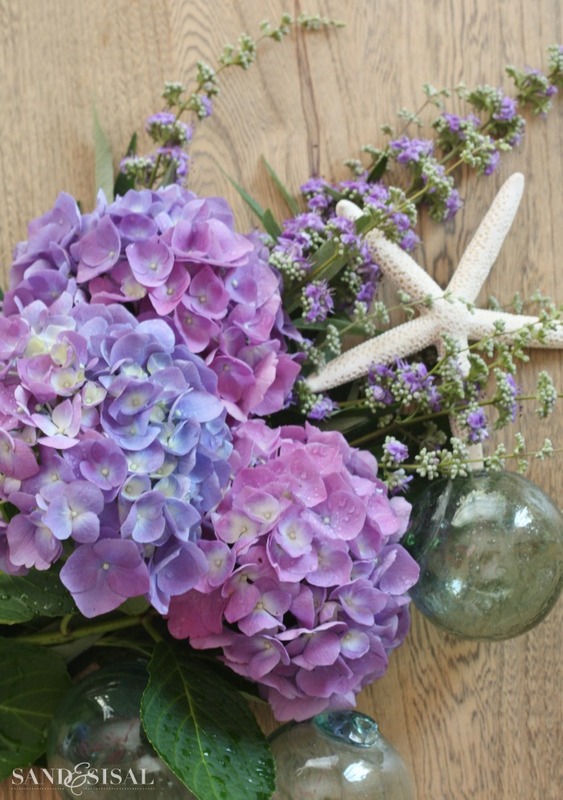 I hope you enjoyed these hydrangea arrangement ideas. Don’t forget to PIN your favorite pics! What a beautiful post!! I just love hydrangeas. All your arrangements are gorgeous!! 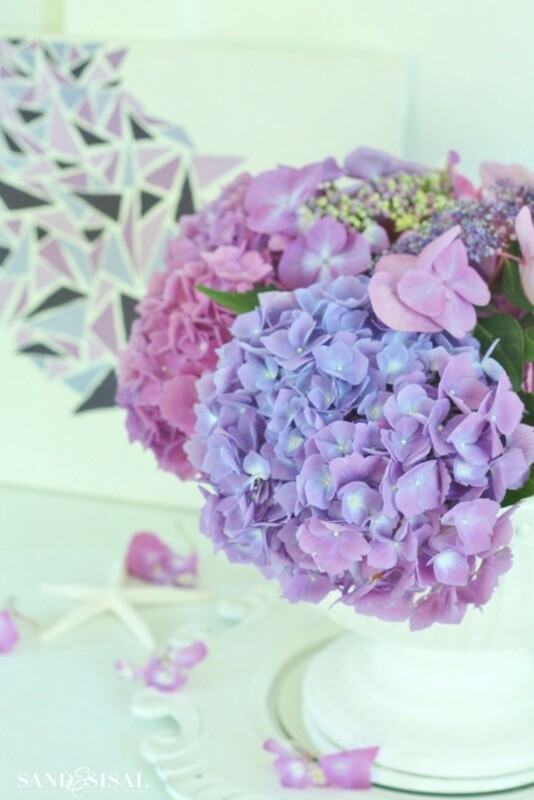 I love hydrangeas and these are gorgeous (those colors are so bright!). Do you find they’re pretty easy to grow? I’m a beginning gardener looking to grow some pretty things I can use in my house and hydrangeas are one of my favorites. Thanks for sharing! Hope the weather cools down a little for you! We are having unusual cool weather in Massachusetts, 70’s !! Love the ideas, beautiful hydrangeas! 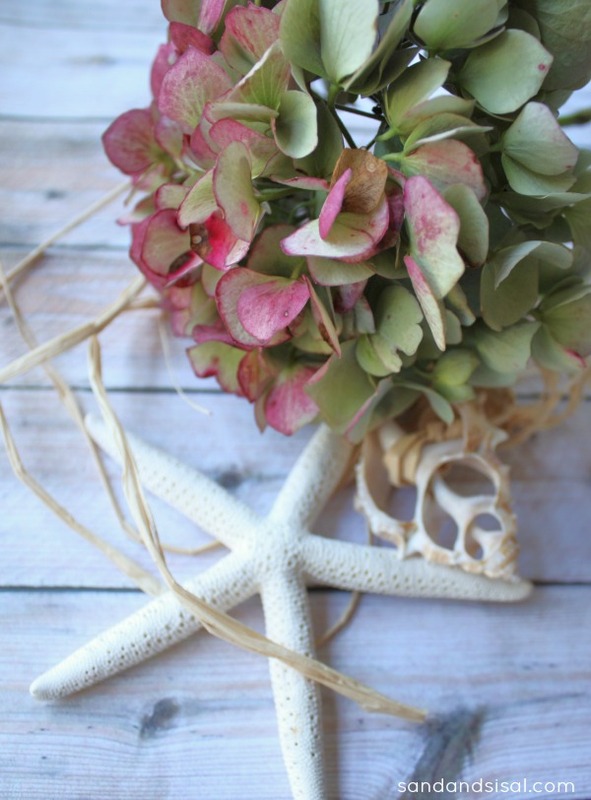 I would love to print and frame a few of the hydrangeas and shells pictures! Can I purchase prints from you? Thanks so much! !